Dubai: It’s a win-win for both the shareholders of Abu Dhabi Commercial Bank (ADCB) and Union National Bank (UNB) even as the merger to create the UAE’s third largest bank was announced, according to experts. ADCB said it plans to merge with UNB and Al Hilal Bank to create the third largest bank in the UAE with assets of more than Dh420 billion. 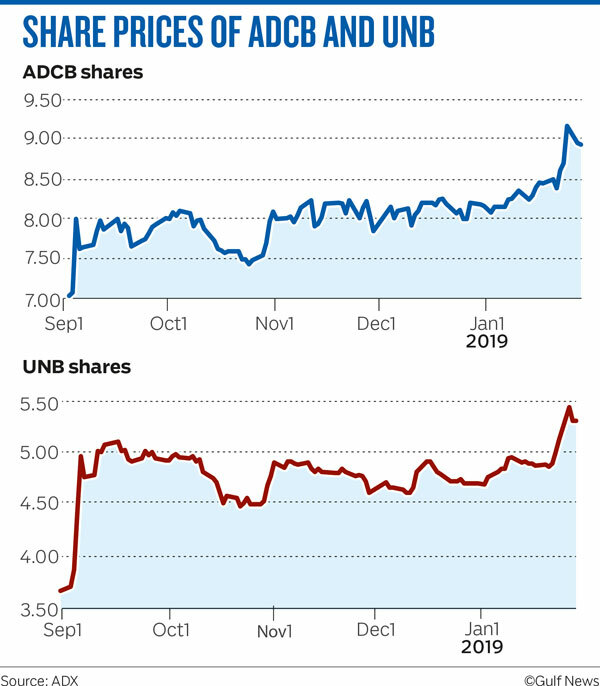 ADCB and UNB shares have been on a gaining streak since the merger intention was announced in September. ADCB shares have gained 26 per cent, while UNB shares gained 42 per cent since September 3, outperforming the Abu Dhabi index, which rose 1.9 per cent in the same time period. “The confirmation of the merger news is a positive and that removes the uncertainity,” Mohammad Ali Yasin, chief strategy officer at Al Dhabi Capital told Gulf News. About the share swap ratio, ADCB said it will issue 0.5966 ADCB shares for every UNB share. “The UNB shareholders has already benefitted from the merger news in terms of share price appreciation so far and they would be benefitting additional 20-30 per cent in the next 18 months,” Yasin said. Yasin said ADCB shares may be poised for further gains as synergies are established and as merged entity would command a higher weightage in the MSCI emerging market index. “If you are a buyer today, you might want to buy ADCB shares,” Yasin said. The merged entity would also bode well for the performance of the Abu Dhabi Securities Exchange, which has been an outperformer in the region after gaining more than 13 per cent in the past one year. “Earlier FAB was the one attracting inflows. We would continue to see upward movement in ADCB as they will have higher weightage [on the MSCI em index] as it’s a bigger bank now. The index would attract foreign inflows and that may happen at the end of the year,” Yasin said. In terms of valuations too, the merged entity currently has a 2019 expected price to earning multiple of 9.57 compared to 14 for First Abu Dhabi Bank, indicating the upside potential for the stock. Tariq Qaqish, Managing Director - Asset Management at MENACorp, also advised shareholders to hold on to the stock. “By looking back at the FGB and NBAD merger, we do expect to see investors to sit on the sidelines until we see the positive effect of the synergy. The focus of the new management will be on managing the operations smoothly, reducing the costs, and maintaining the existing customers which will take lots of time and efforts. The merger of FGB and NBAD was successful and we expect to see the same for ADCB, UNB and Al Hilal which will generate higher return on equity, better capital structure and improved cost to income ratio,” Qaqish said.